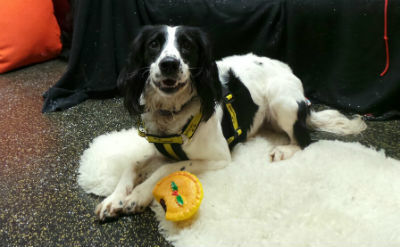 This beautiful springer spaniel is 18 month old Lily, a lovely dog who enjoys plenty of fuss and attention. She lacks confidence, and is slightly wary of new people, so would need a family who are willing to be patient with her and put the time in to make her feel at home. She is looking for a quiet home but loves her walks so would be happy with an active family. Lily can live with children over the age of eight. If you think you could give the lovely Lily a new home please get in touch with Dogs Trust Shrewbury on 01952 770225 or visit Lily at the centre at Shrewsbury, Roden Lane Farm, Telford, Shropshire, TF6 6BP. For more information on Dogs Trust you can visit their website www.dogstrust.org.uk. Christmas, why not get involved with the Dogs Trust #presspaws campaign.